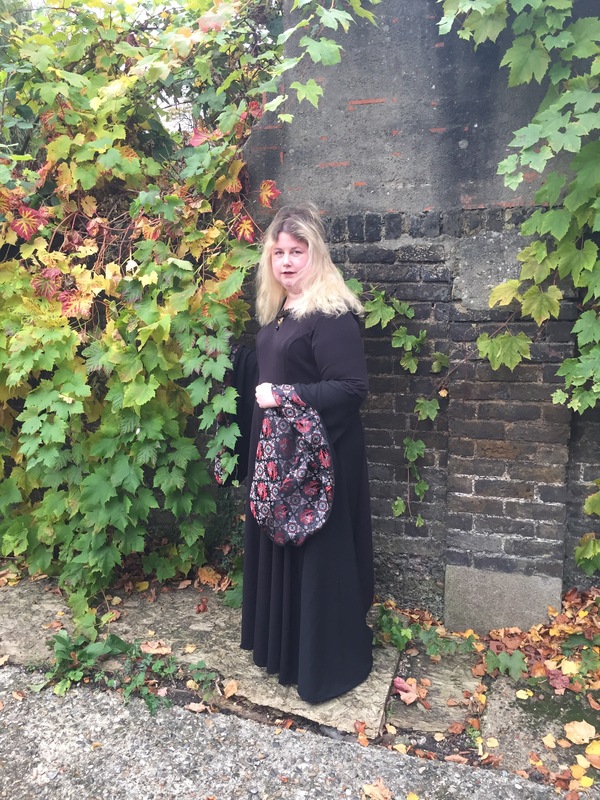 Simplicity 1137 – the medieval goth dress. So about 18 months ago, Simplicity patterns decided to bring out a spate of Game of Thrones inspired patterns, which I viewed with interest, because although I have no intention whatsoever of doing straight Game of Thrones cosplay, some of the patterns looked like they’d make good medieval or goth dress basics if done in a different colour way. Such a one is Simplicity 1137, based on costumes worn by the character Sansa Stark, it looks to me a bit of a mess on the cover, however looking at the technical drawings I thought it had good potential as a goth dress. No one had reviewed it, which made me a little nervous, but I hoped that was down to the newness of the pattern rather than it being awful. However for this first version I decided to use random fabric off the local fabric stall rather than anything nice, just in case. This actually worked out rather well, as the fabric I chose (largely on the basis that it was the only black fabric available in the necessary quantities – this dress is a massive fabric hog) turned out to be not only machine washable but had the right level of weight for the dress, which needs quite a heavy fabric, & did not need underlining, which is what Andrea Schewe, the designer suggests in her Blog post about the pattern. Andrea Schewe’s blog is an invaluable resource btw if you are planning on making more recent Simplicity costume patterns. She writes about all the ones she designs and has guest posts by other designers, often there are tips, which you just wouldn’t know if you weren’t told that make the difference between a mess and a decent make. Such as this one about using a decent weight fabric or underlining it. When I had finished the folds of the dress hung beautifully! 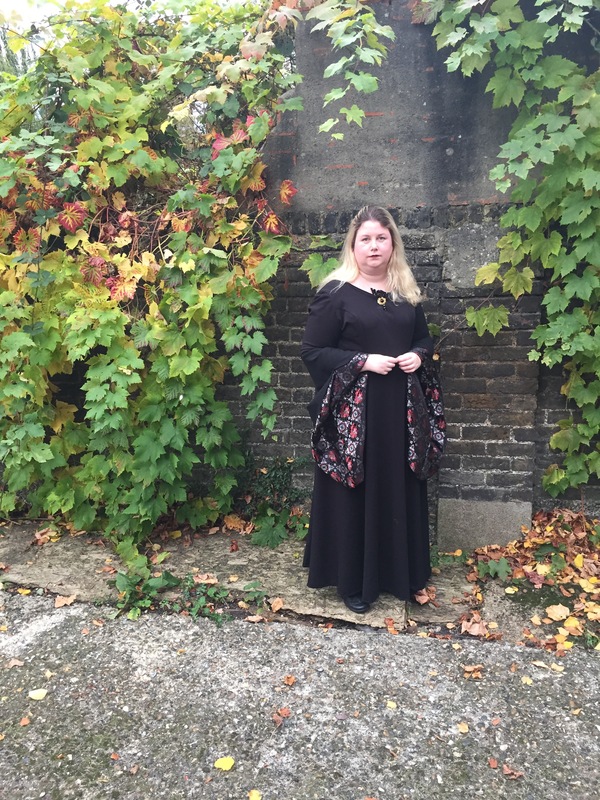 For the sleeves of the dress I decided to use a black and red brocade fabric I picked up a while back and reviewed in This post. 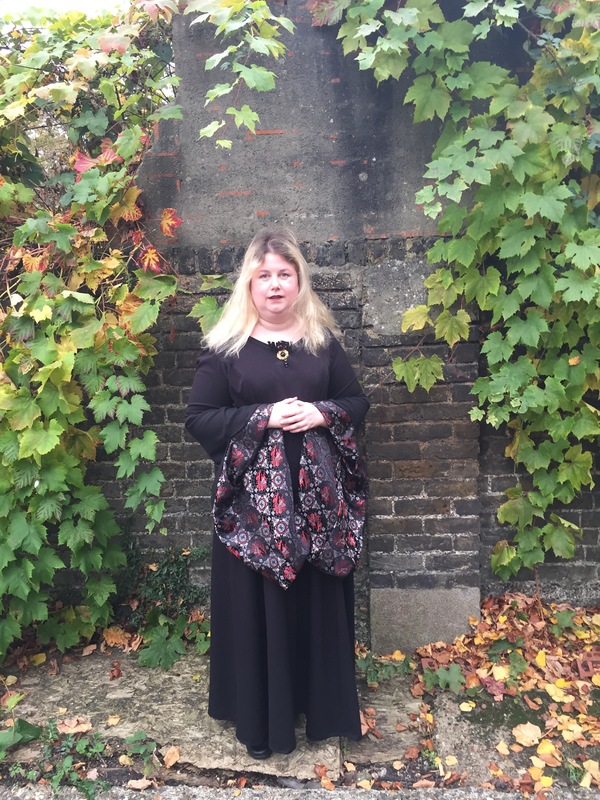 It’s by Sartor, a company who provided some of the fabric for Game of Thrones, so I thought it was appropriate, & bonus points I bought one of their cheaper polyester brocades which means like the main part of the dress, it is also machine washable, which is a massive advantage to me. So…. I’d heard rumours that Simplicity had resolved their insane sizing issues with the costume patterns at least, so I cut a size 20, however I didn’t much worry about having massive seam allowences, and it fit perfectly! There is a logical point after you’ve sewn the seams of the dress together and put in the zip but before you add the sleeves and facings to fit the dress properly, so I didn’t make a proper mock up. It fit extremely well with minimal adjustment. I did however wait till I’d fitted it to cut out the sleeves fabric, as I didn’t want to waste expensive fabric if the dress wasn’t going to look good. It is extremely easy and a straightforward pattern to follow. I did it in three batches of about 3 hours each. The only issue I had was working out what the hell the hem is supposed to be doing. I think there’s supposed to be a slight train at the back, at least there was when I’d finished, but I’m not sure if there definitely meant to be. Anyway, piccies of the dress…. I think it’s really flattering. I’m totally happy with it. 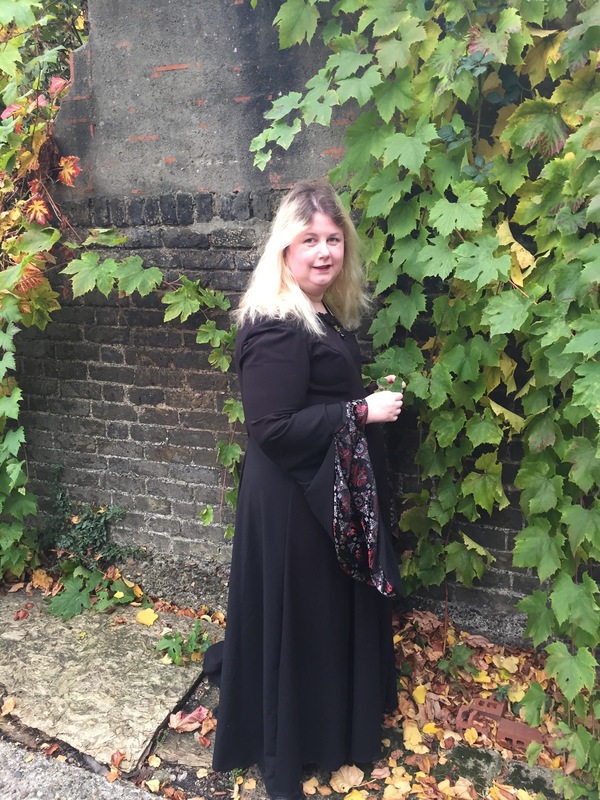 Although I wore it for Halloween as a witch costume I think it’s professional and non-costumey enough looking that I could get away with it in a goth club. I would make this again in a flash if I could think of a reason to, & I would definitely reccomend the pattern to other people.